Shopping for Green Lantern Vinyl Figures? Green Lantern battles it out with Sinestro at San Diego Comic-Con 2011! Detailed artwork on stylized vinyl! Green Lantern battles it out with Sinestro at San Diego Comic-Con 2011… and in your toy box! 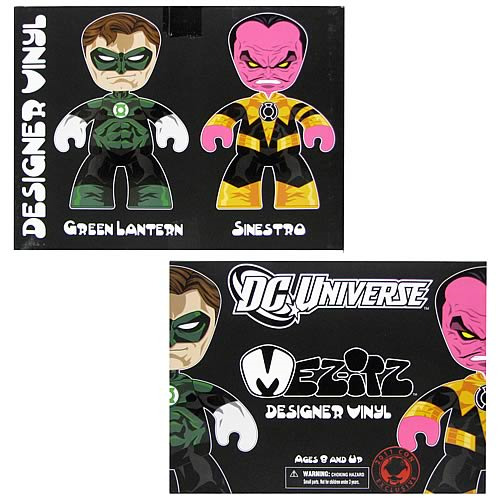 These Green Lantern and Sinestro Figures feature detailed artwork on stylized vinyl, and five points of articulation. They come packaged in a sturdy, collector-friendly box. This is a non-numbered limited edition item. Don't delay. Order today! In a universe as vast as it is mysterious, a small but powerful force has existed for centuries. Protectors of peace and justice, they are called the Green Lantern Corps. But when a new enemy threatens to destroy the balance of power in the universe, their fate and the fate of Earth lie in the hands of their newest recruit, the first human ever selected: Hal Jordan. Hal is a gifted and cocky test pilot, but the Green Lanterns have little respect for humans. But Hal has one thing no member of the Corps has ever had: humanity. With the encouragement of fellow pilot and childhood sweetheart Carol Ferris, if Hal can quickly master his new powers and find the courage to overcome his fears, he may become the greatest Green Lantern of all!